Here we go! Finally after all the teasing and sorting out all the finer details to make sure VTSS first collaboration project with 3D artist Miguel Vasquez is HERE! Like we said before, over and over again, for those whos been wanting to keep tabs on the incredible and creepy vinyl Untooned SpongeBob Squarepants and Patrick Star Best Friends Forever art collectable figures by Miguel Vasque x VTSS Toys. Miguel & VTSS updated us all with a little progress and the SIZE of the figures! We questioned if it was possible to come close to Miguel’s original 3D render, WARNING “spoiler” its looking close. 3D artist Miguel Vasque getting his version of surrealism/ untooned/ human SpongeBob Squarepants and Patrick Star turned into real vinyl figures? 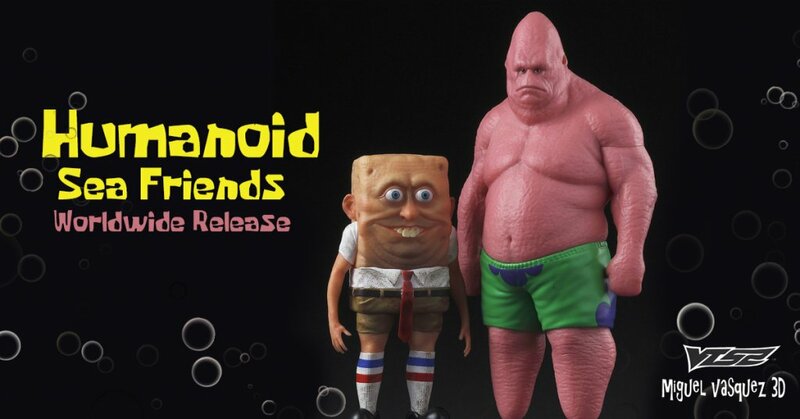 It seems like Miguel Vasque viral 3D renders of the most impressive and scary renditions of SpongeBob Squarepants and Patrick Star has been made into vinyl toys by VTSS Toys. Miguel ready to break the internet once again! When we first saw Miguel’s rendition of SpongeBob Squarepants and Patrick Star we couldn’t believe our eyes, freaky and creepy yet EPIC. If VTSS can pull off the texture and colours we will be impressed. Start saving as SpongeBob Squarepants and Patrick Star Figures are HERE for pre-order. Miguel Vasque x VTSS Toys presents to you Humanoid Sea Friends vinyl series. both figures into physical one. Trust us! shipping on end of May. Limited to 500 pieces in the worldwide. Shipping Date: 2018 end of May. The folks at BuzzFeed did a mini interview with Miguel check it out HERE. Miguel’s original 3D renders below. Could we see Ed come into fruition too in the near future? If you want to get your Designer Toy news first, you should look to download our new TTC Mobile App. Designer Toy news direct to your smartphone. No dealing with social media algorithms. It’s FREE. http://www.vtsstoys.com/ for more vinyl/ resin art collectables. Find Miguel on Instagram and Twitter.